Unicity is a Utah based company which sells a wide range of dietary supplements and cosmetics. They have been promoting their products through network marketing since 2001. Here at The Finance Guy, we believe that you can't make money with MLM, but we'll give Unicity a chance to prove us wrong. There is a wide range of over 400 Unicity products, which are being sold in more than 50 countries by their network of MLM distributors. They say that the products were developed using Unicity science, which helps 'improve health and quality of life'. We looked at the official Unicity Opportunity page, which only had some very limited information. We did learn that this was a system which costs US $40 to join and can 'improve your health and build your wealth'. In true MLM tradition, there are 8 ways to earn income with Unicity. As expected, the the amount you can earn will depend on your rank. Unicity tell us that they have a 'simple rank advancement system'. They go on to tell us that you will 'receive a detailed guide after you enroll as a distributor'. While this lack of detail might be explained as 'not wanting to confuse new recruits'. It could also be explained as 'Unicity is trying to sign you up before you see all the details'. We believe that this sort of lack of transparency is an early warning sign that the opportunity doesn't work. You can earn a profit margin if you buy products at the distributor price, and sell them at either the full retail price or the preferred customer price. The amount you can earn from each product is shown on the 2016 Unicity price list. We believe that retail margins are the best way to earn income with any MLM. At the end of the day when you join network marketing, you become a commission based salesperson. Unfortunately, like all MLM compensations plans, Unicity only gives a 2 sentence mention to retail profit. The reason you can't earn rebates in your first month, is because your PV will go toward a Fast Start Bonus. 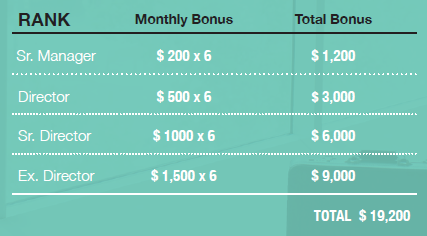 Unlike other MLMs there is a chance that you will not actually earn this bonus. Depending on how qualified they are, your up-line will get bonuses of between 38% and 53% on whatever you spend in your first month with Unicity. It is possible for new distributors to earn the 15% 'Enroller' bonus. To qualify for this, you'd need to order 1,000 PV worth of product in your first month. In other words you can get a a 15% refund if you spend US $1,250 on Unicity products in your first month as a distributor. They might say that this is an incentive to get you started. We might say, it's a way to get you to spend a lot of money before you really understand the products. This is the commission you can earn from the PV generated by all the distributors in your Unicity downline. You can earn an infinity bonus of 5% on the PV of distributors in your downline. As you achieve higher ranks in the Unicity hierarchy, you can earn this on greater 'depth'. Once you reach the rank of 'Presidential Diamond', you can earn 5% on up to 9 levels in your Unicity downline. If you reach the rank of Presidential Diamond, you will qualify for your first additional distributor position. If you make it all the way to the rank of 'Global Ambassador', then you will have earned a total of 5 additional distributor positions (ADPs). The advantage of these ADPs is that you can effectively become part of your own downline. Unicity will also let your new position qualify at the presidential levels. If you sign up new distributors under your new ADPs, then you can earn multiple infinity and lifestyle bonuses on any PV generated. Effectiely you can increase your share of commission from each distributor in your downline by up to 400%! Even though they told there were 8 ways to earn, there is also a ninth. If you achieve the rank of 'Global Ambassador', then Unicity will pay you this bonus in every month that you provide a Unicity training seminar. The compensation plan has shown us that it is possible to earn money with Unicity, but that doesn't mean that it's probable. To find out how much people are making, we looked at the 2015 Unicity Income Disclosure Statement, which is the most recent one provided. It could be that the years since have not been as good but even in 2015 we see that the Unicity opportunity is just another MLM. It starts with the familiar claim that the Unicity opportunity can 'Make Life Better by getting Unicity's quality products at a special distributor price'. We later see the claim that 'A large majority of people sign up as Unicity Distributors just to get the product discount'. If that is true, then why do people become preferred customers? We did our best to construct the above table with the limited data provided by Unicity. We included expenses of $1,500 per year to show the cost of 100 PV per month. Remember that this is the minimum spend required to qualify for commission. Based on our calculations, 97.3% of Unicity distributors lost money in 2015. 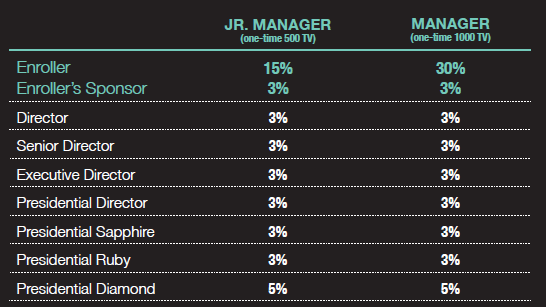 Even though Unicity offers many ways to earn, only 0.2% are making as much as a regular job. In other words only 1 in 500 Unicity distributors is earning a full time income. The opportunity which claims to 'improve health and build wealth', appears to be failing for 499 / 500 distributors. Another problem is the generous compensation plan. If you reach the Presidential Diamond rank, you can earn up to 45% in infinity bonuses. the problem is if you aren't at this level then these bonuses are included in the distributor price you pay for your Unicity products. As a new distributor 45% of what you pay to Unicity goes to your upline as commission. Dr Taylor would say that this raises Red Flag 4 - Most of the Rewards go to your upline. 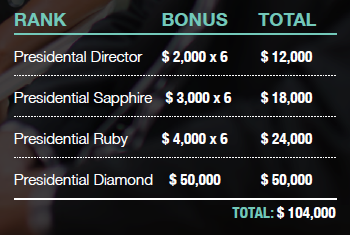 The depth of the bonuses also raises Red Flag 5 - More than 5 levels in the payout plan. As we have seen in the past, your chances of making money is less than 1% when these flags are raised. Even though network marketing systems closely resemble pyramid scams they are legal as long as there is a product or service attached to them. That being said, there is a difference between legal and ethical. By attaching the smoke and mirrors of future financial freedom, Unicity is able to charge substantially inflated prices. If you are looking for an opportunity to replace your income, then we suggest you research all your options before making a decision. It's quite likely that you might find one where your chances of success are better than 1 in 500. If you are considering joining just to get the products cheaper, then we recommend researching competitors products. With most MLMs, we find that you can get products of equal or better quality at lower prices from regular stores. The over inflated distributor prices are often more expensive than competitors full retail prices. This review is an expression of the opinions we formed while researching the Unicity opportunity. We'd love to hear your opinions in the comments section below, especially if you can share your experiences with Unicity.